Most apps deliver conveniences, but Pager wants to do so in the form of emergency medical assistance. 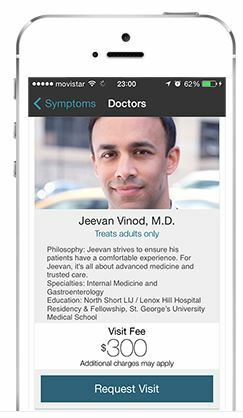 The new app is a physician pager for sick New Yorkers who just can’t leave their house and doesn’t mind paying $300 for an emergency home visit at night or on weekends. We’ve developed a one-of-a-kind mobile app to bring back the forgotten house call, tapping into a network of tech-savvy doctors and connecting them with patients across New York City. The end result? High-quality and convenient personal care delivered at the tap of a finger, when and where you need it. Pager’s co-founder, Oscar Salazar, is an engineer who worked on Uber in its early days, so it’s no coincidence that Pager sounds like an expensive cab service for doctors. Unlike Uber, Pager will also let you get health services over the phone. A voice consultation will cost you $50 with $40 going to the physician. If s/he determines that you need immediate, physical attention, that’ll cost you $300, with $250 going to the physician. Since the app is fairly new, and all of the doctors are certified, there’s a limited supply of only twenty. Expect the app to experiment with surge pricing, just like Uber, once the flu season starts.